Land Rover Freelander 1 TD4 2.0L Diesel Band New Clutch Kit - URB500070. Kit embrague LAND ROVER DISCOVERY TDi, Año: 1994 QURB10076001, 700366, 23100320LS. Referencia : 688271, Observaciones: Land rover : ftc4631, ftc4630, ftc5200, uqb000120 lti : ftc5200 santana : ftc5200 luk : 627300900, 627 3009 00 quinton hazell : qkt2138af sachs : 3000 951 221, 3000951221 valeo : 826333, 826025 Código interno: 264243. Kit embrague LAND ROVER discovery tdi, Año: 1995, Observaciones: maza y disco (disco 24.5 cm). Llama ahora y pide tu pieza. También atendemos por whatsapp. Enviamos a toda España. Consulta nuestra web, disponemos de un amplio catálogo de piezas. Kit embrague LAND ROVER discovery 2.5 turbodiesel, Año: 1996. Referencia : FTC4204, Observaciones: maza y disco, disco mide 23.8 cm. Código interno para información: 1276765. Llámanos y pide tu pieza. Nosotros podemos comprobarlo. Wir können es überprüfen. Nous pouvons le vérifier. NUOVO Kit Frizione con Forcella Land Rover Defender, Discovery "Carabinieri" 2.0 MPI. Codice SIVAR. NUOVO Kit Frizione Land Rover Serie 2/3 88/109 9.1/2" 1961-1984. Código interno: 1487869. Kit embrague LAND ROVER FREELANDER 2.0 Di hardback, Año: 1999. Referencia : 323077310, Observaciones: Maza y disco, disco 23 cm. Wir können es überprüfen. Nous pouvons le vérifier. Codice SIVAR. NUOVO Kit Frizione 2 pezzi OEM Land Rover Defender e Discovery 2000 benzina "Carabinieri". Kit embrague LAND ROVER FREELANDER 2.0 Td4, Año: 2001 Código interno: 171650. Si no encuentra la versión que necesita nos esforzaremos en conseguirla. Nós podemos verificar isso. Wir können es überprüfen. Kit embrague LAND ROVER FREELANDER E Familiar, Año: 2002. Referencia : URB500070 Código interno: 174419. Si no encuentra la versión que necesita nos esforzaremos en conseguirla. Nós podemos verificar isso. Kit embrague LAND ROVER DEFENDER TD5 110 Hard Top, Año: 2001 281744Z0, 76458 FTC4631. Referencia : 281274P0, Observaciones: Valeo : 826025, 826333 land rover : ftc5200, ftc4631, uqb000120, ftc4630 lti : ftc5200 santana : ftc5200 luk : 627300900, 627 3009 00 quinton hazell : qkt2138af sachs : 3000951221, 3000 951 221 Código interno: 259834. DEFENDER 110 -2.5 Familiar 84cv ,2.5 D Familiar entoldado 67cv ,2.5 TDi Familiar entoldado 109cv ,2.5 D Familiar 67cv ,2.5 TDi Familiar entoldado 113cv ,2.5 TDi Familiar 113cv ,2.5 Familiar entoldado 84cv ,2.5 TDi Pickup 109cv ,2.5 TDi Familiar 109cv. LAND ROVER FREELANDER (LN) 2.0 Td4 4x4 2001/03 - 2006/10 80 109. LAND ROVER FREELANDER (LN) 2.0 Td4 4x4 2000/11 - 2006/10 82 112. ROVER 75 (RJ) 2.0 CDT 1999/02 - 2005/05 85 115. ROVER 75 (RJ) 2.0 CDTi 2003/02 - 2005/05 96 131. Land Rover Freelander 1 TD4 2.0L Diesel Banda Nuevo Kit de embrague-URB500070. Land Rover Freelander 2.0 TD4. 1 x Simple Masa Volante Motor. 1 x Tapa Embrague. 1 x Place De Embrague. The manufacturers report will be final and we shall have no further liability to you. Simple - Use any Debit or Credit Card. Freelander 1 TD4 Full Clutch Kit. 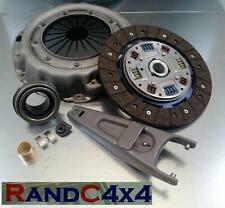 Land Rover Freelander 1 TD4 Complete Clutch Kit. Freelander 1 2.0 TD4, (2000-2006). Freelander Parts. Clutch Slave Cylinder / Release Bearing UUB0. Series 2 & 3 - Defender 90/110/130, Discovery 1,2,3,4,5 & Sport - Freelander 1 & 2 - Range Rover Classic, P38, L322, L405, Sport & Evoque. Part Number: LR009366. Land Rover 200 & 300TDi Complete Clutch & Fork Kit. Defender, 200 & 300TDi Models. Discovery 1, 200 & 300TDi Models. Land Rover Parts & Accessories. Land Rover Parts. Discovery Parts. LAND ROVER FREELANDER 2 (FA_) 2.2 TD4 4x4 2006/10 - 2014/10 110 150. LAND ROVER FREELANDER 2 (FA_) 2.2 TD4 4x4 2007/01 - 2014/10 112 152. LAND ROVER FREELANDER 2 (FA_) 2.2 TD4 4x4 2006/10 - 2014/10 118 160. Código de SIVAR. MPN LR30300. Codice ricambio originale OE/OEM LR30300. Nuevo embrague Kit 2 piezas OEM Land Rover Defender < abarcan clase = "notranslate" > y Discovery 2000 gasolina "Carabinieri". It’ll even take mildly tuned motors that have a little extra poke than standard! (Pedal Weight no Heavier than original). 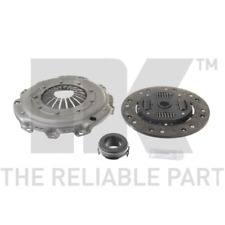 We have developed our whole range of Land Rover clutches using our detailed knowledge of clutches and experience within the Land Rover market, we only do Land Rover clutches, thats why we can bring only the best clutch kits to you. FREELANDER 1996 - 2006(2.0L I4 8V TCIE,MANUAL TRANSMISSION). PARTS COLOUR MAY VERY DUE TO MANUFACTURE PRODUCTION. 3 PIECE CLUTCH KIT 1.8 K & 2.0. PICTURES AND PART NUMBERS ARE FOR REFERENCE ONLY AND DO NOT IMPLY THE MANUFACTURER. LAND ROVER FREELANDER 1 SACHS - CLUTCH KIT - PLATE / COVER /BEARING SACHS CLUTCH KIT CONTAINS CLUTCH FRICTION PLATE CLUTCH COVER BEARING PART NUMBER - URB500060S All our items are high quality replacement parts. Manufacturers part numbers are used for identification purposes only. Images are for illustrative purposes only **** PLEASE READ OUR WARRANTY, RETURNS DELIVERY TERMSBEFORE BUYING. Nuevo kit de embrague de servicio pesado de Bearmach, fabricado por Clutchfix. 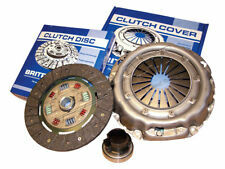 New Bearmach heavy duty clutch kit, manufactured by Clutchfix. The experts in British Engineering at Clutchfix HQ have designed a new and improved style of Heavy Duty Clutches suitable for Land Rover vehicles. Apto para todos Defender 2.5 litro de gasolina de 4 cilindros con transmisión de 5 velocidades (gasolina). Land Rover NUEVO Kit de embrague que consta de disco de embrague, placa de presión y el cojinete. Defender - 200Tdi & 300Tdi. Discovery 1 - 200Tdi & 300Tdi. Range Rover Classic - 200Tdi & 300Tdi. Clutch Fork. Clutch Plate. Clutch Cover. BORG & BECK complete clutch assembly for Land Rover Defender/Discovery TD5. Manufactured by BORG & BECK. UK Mainland Orders. 4 Piece kit includes Cover plate, friction plate and release bearing, & spigot bush. Manufacturer Part Number BR 3029HD. Nuevo kit de embrague de servicio pesado de Bearmach, fabricado por Clutchfix. Bearmach garantía de 3 años New Bearmach heavy duty clutch kit, manufactured by Clutchfix. TD5 OEM Clutch Kit. Defender & Discovery 2 TD5 New Complete Clutch Kit. Discovery 2 TD5(1998-2004). Defender TD5(1998-2006). Defender Parts. Series 2 & 3 - Defender 90/110/130, Discovery 1,2,3,4,5 & Sport - Freelander 1 & 2 - Range Rover Classic, P38, L322, L405, Sport & Evoque. 0E part numbers for reference only: – STC8358, LR009366. Discovery all TDI models. Wheel Nuts Hi lift jacks & Acc. Tyres Safari Snorkes Defender Parts Discovery Parts Range Rover Parts Wheels Tools Gift Ideas Series Discovery 1 89-93 Discovery 1 94-98 Discovery 2 99-04 Range Rover Classic Range Rover P38 Range Rover l322 Freelander Discovery 3 Defender 90 & 110. 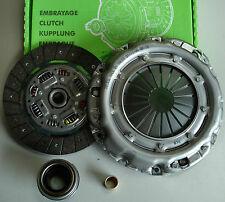 Land Rover td5 Complete Clutch. DISCOVERY TD5. DEFENDER TD5. Has Clutch plate. Manufacturers Part numbers are used for reference purposes only. Any item which has failed will be subject to their inspection. NUOVO Kit Frizione VALEO Land Rover Defender 90/110, Discovery, Range Rover 2.4 e 2.5TD. Part number:-FTC2957HDKIT. Defender TDi – Diesel only. Land Rover TDI 200/300 Heavy Duty Clutch Fork Kit. Heavy-duty clutch fork, slipper pads, spigot bush, staple and clip. Range Rover Classic TDi – Diesel only. 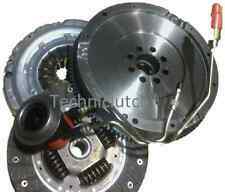 LAND ROVER DISCOVERY 2 TD5 VALEO OEM CLUTCH KIT OUR KIT CONTAINS..... CLUTCH FRICTION PLATE CLUTCH COVER THRUST BEARING SPIGOT BEARING **Original Equipment Valeo clutch kit. Valeo are Original Equipment manufacturers to Land Rover** PART NUMBERS - DA5550G/FTC5200G/LFB500050 All our items are high quality replacement parts. Manufacturers part numbers are used for identification purposes only. **** PLEASE READ OUR WARRANTY, RETURNS DELIVERY TERMSBEFORE BUYING. TD5 Valeo/LUK Clutch & Flywheel Kit. Land Rover TD5 Complete OEM Clutch & Dual Mass Flywheel Kit. Discovery 2 TD5, (1998-2004). Defender TD5, (1998-2006). Defender Parts. Series 2 & 3 - Defender 90/110/130, Discovery 1,2,3,4,5 & Sport - Freelander 1 & 2 - Range Rover Classic, P38, L322, L405, Sport & Evoque. Part number:-FTC2957HDKIT. Land Rover TDI 200/300 Heavy Duty Clutch Fork Kit. Heavy-duty clutch fork, slipper pads, spigot bush, staple and clip. Discovery 1 TDi – Diesel only. Range Rover Classic TDi – Diesel only. 0E part number for reference only:- 576137. Defender TD5 all models. Wheel Nuts Hi lift jacks & Acc. Tyres Safari Snorkes Defender Parts Discovery Parts Range Rover Parts Wheels Tools Gift Ideas Series Discovery 1 89-93 Discovery 1 94-98 Discovery 2 99-04 Range Rover Classic Range Rover P38 Range Rover l322 Freelander Discovery 3 Defender 90 & 110. Defender 90 and 110 all TDI models. Wheel Nuts Hi lift jacks & Acc. Tyres Safari Snorkes Defender Parts Discovery Parts Range Rover Parts Wheels Tools Gift Ideas Series Discovery 1 89-93 Discovery 1 94-98 Discovery 2 99-04 Range Rover Classic Range Rover P38 Range Rover l322 Freelander Discovery 3 Defender 90 & 110. Will fit both Defender TD5 and Discovery 2 Td5. Land Rover TD5 Complete Clutch with Flywheel. The flywheel will convert to non dual mass. Clutch cover. Clutch plate. Kit pompa frizione principale secondario (cilidretto). Land Rover Defender. Land Rover Discovery. Land Rover (SOLO guida da sinistra). Range Rover Classic. La pompa è già assemblata, da montare senza togliere i tubi onde evitare che entri aria. 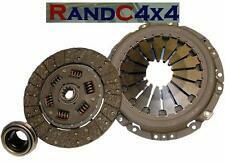 LAND ROVER FREELANDER 1 1996-06 3 PIECE CLUTCH KIT 1.8 K & 2.0. PART- URB500060. FREELANDER 1996 - 2006(2.0L I4 8V TCIE,MANUAL TRANSMISSION). Terrain Vehicles LTD is a family run Independent Land Rover and Range Rover specialist garage. Land Rover Freelander LN SUV 2.0 TD4 4 x 4 01-06. Model Freelander. Make Land Rover. Se trata de un embrague de recambio ideal. 2 piezas Kit de embrague. Kit de embrague equipo: 2 pieza servicio. Sobre el Kit de embrague.